Surf's Up: First tentative steps, Coast Rider Academy, Clifton Beach, Tasmania. It’s fun, it’s a great way to keep fit, it instils a deep and abiding respect for the ocean and the environment, and it might just kindle a lifelong passion. Surfing was first observed by Europeans in Tahiti in 1767 and in the intervening centuries it has gone on to become one of the great Australian sports – and the good news is it’s never too late (or too early) to start wiping out… er, hanging ten, we mean. Anyone who’s admired the cool, impossibly laidback surfers as they seamlessly slide through barrels and weave across waves could be forgiven for thinking it’s easy – we assure you, it ain’t. That’s where surf schools come in and luckily there are plenty of them across Australia. A few sessions with the pros will equip you or the kids with the smarts and the skills to start your own love affair with this addictive water sport, which inspires so much passion in so many others. And there’s a bonus for parents: enrolling the kids in a week of surfing lessons frees mum and dad up for some relaxation time. Plus it’s exhausting, guaranteeing sweet dreams after a big day on the waves. Let’s Go Surfing Bondi, NSW – From $95 a lesson or $350 for a family private lesson. 02 9365 1800. Surf the Bay South Coast, NSW – From $40 a lesson; special family (four people) surf or stand-up paddleboard deal for $120 (until end Feb 2014).0432 144 220. 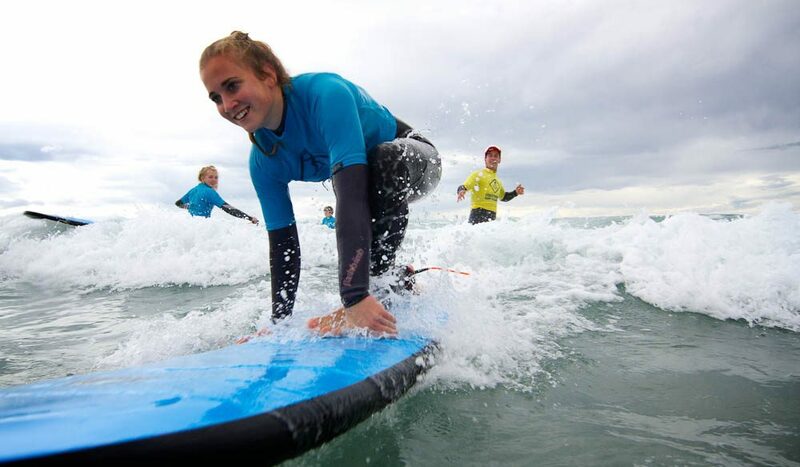 Coastrider Surf Academy, Clifton Beach, Tas – From $50 a lesson or $70 one-on-one. 0419 324 921. Get Wet Surf The Spit, Surfers Paradise, Qld – Learn at the beach or in the wave pool. From age five and up. From $45 a lesson. Family lesson (includes two adults and two children) for $180. 1800 438 938. School of Surfing Trigg, Mullaloo, Leighton and Rottnest Island, WA – From $40 a lesson, or $70 for a private one-on-one lesson. 08 9448 0004. Torquay Surf Academy Urquhart’s Bluff, Lorne, Cosy Corner, White’s Beach and Bancoora River, Vic – From $60 a lesson. 03 5261 2022. Kingo Surf School Goolwa Beach and Port Lincoln, SA – From $40 a lesson.0427 842 085.